This is the last part of the "Data Isolation and Sharing in a Multitenant System" article, which is also a continuation of my post that outlines the benefits of a well encapsulated data access. 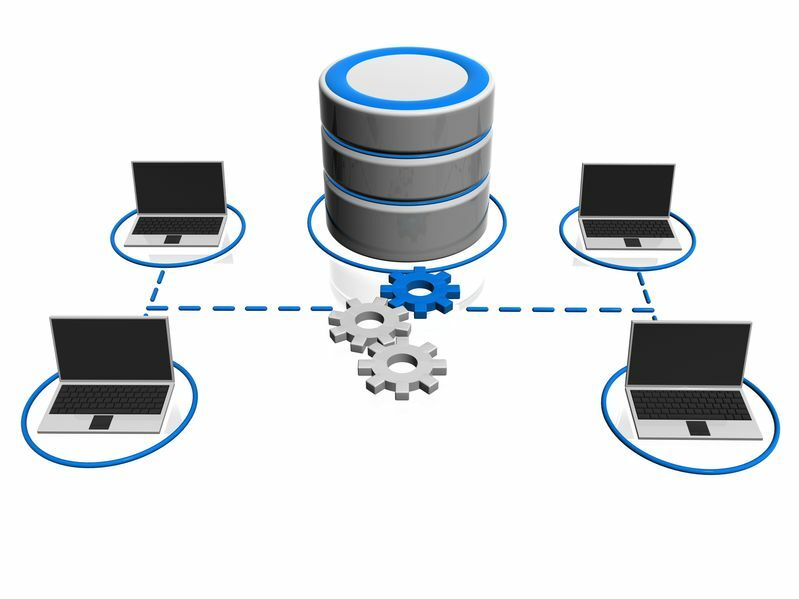 In this post, we'll look in detail at the implementation of the Shared Database strategy, explained in the first part. We'll see how to refactor the database schema for multitenancy and then how to build a Lambda Expression to filter the tenant specific data. This means that all the tables that hold tenant specific data will have the TenantID as the discriminant column. 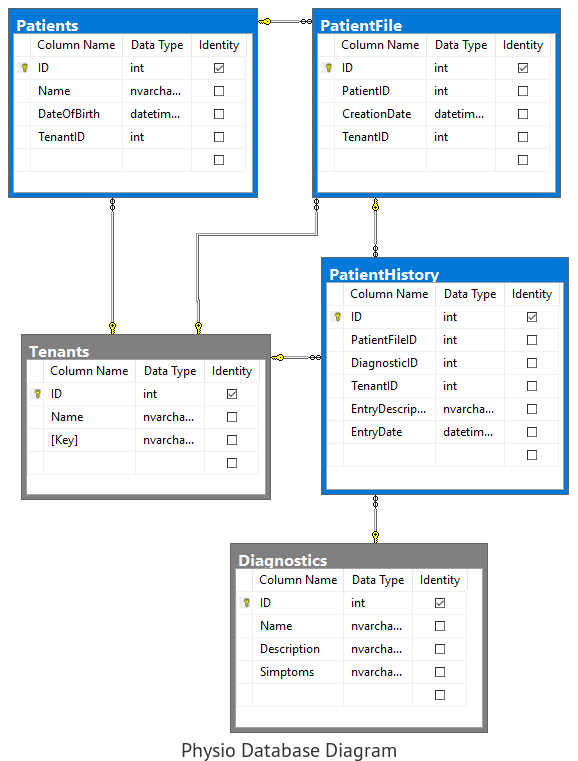 Here is a small view on the database diagram for our example, where with blue are the tenant specific tables. If we're starting the project with multitenacy in mind, we'll add the TenantID from the start, so we can skip the next section and go directly at the data access. Otherwise, if we are in the case where we add multitenancy at a later stage of the project, we need to refactor the database to add the TenantID column to the tenant specific tables. Doing this is not as easy as it sounds, especially if we have data which we want to preserve. Basically, we need to create the Tenants table and to insert in it, a row for the first tenant. (We assume that all existent data belongs to this First Tenant). Based on this, we can create a small tool (it may be just another T-SQL script) which generates such scripts for all the tables that keep tenant specific data. 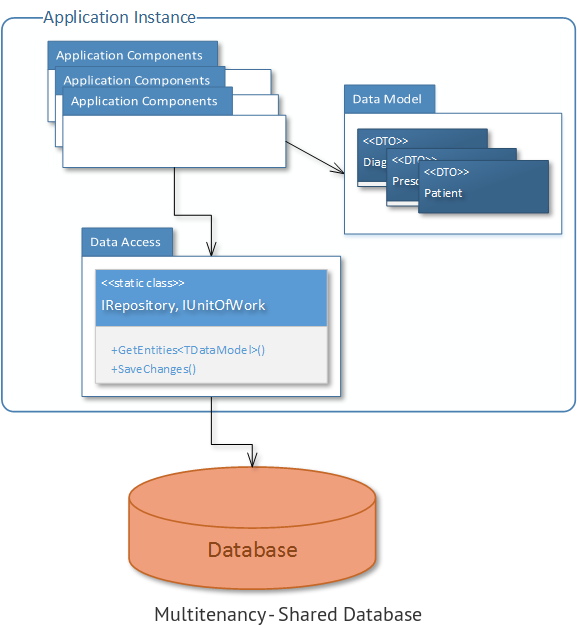 Another option to do the database schema refactor, is to use an existent schema compare tool. Such a tool may be the SQL Server Data Tools (aka Visual Studio Database Project). The next step is to make sure that tenant data is isolated. This means that each query or command we send to the database must have a WHERE TenantID = ... clause appended. Here, having a well encapsulated data access implementation makes a huge difference, because it assures us that all the queries and commands go through it, so we can intercept them to append the WHERE. If we are using a Linq based data access, we can build a Lambda Expression for the TenantID = currentTenantId filter and add a .Where() with it, to IQueryable<T> we're going to pass to the caller. If the data access is built on top of Entity Framework (EF) this simplifies to adding the .Where() to the DbContext.DbSet<T> property. Actually, we don't have to modify the existent Repository or UnitOfWork classes. We could apply the Decorator pattern and write a MultitenancyRepository which wraps the existent implementation and does the filtering based on the current tenant. Lets look at the two helper functions we've introduced. The GetCurrentUserTenantId() is similar with the one from the previous post, where we've looked at separate databases strategy implementation. It relays on the existent tenant_key claim of the current user, which should be set by the authentication mechanism. Then, it uses a cache build from the Tenants table to return the tenantId which corresponds to the key. Nothing fancy. The BuildWhereExpression<T>()is a bit more complex. It needs to build a Binary Expression with the equals operator. The left operand should be the TenantID property of the current entity and the right operand the tenantId which is passed as a parameter. For the Patient entity this whould be: patient.TenantID == tenantId. If the current entity type is not implementing ITenantEntity interface, then on the else branch we will just build and return an expression which is always true so the .Where() we append has no effect for the tenant shared tables. Now, if we do the same for the UnitOfWork class we have consistently achieved data isolation for each tenant data at the data access level. You can see a full running demo of this implementation if you go to my Code Design Training GitHub repository and open the SharedDbConsoleDemo sample.